A man who was previously arrested for a drug charge was again apprehended by police after he was allegedly caught red-handed selling shabu in Tagbilaran City on Saturday. 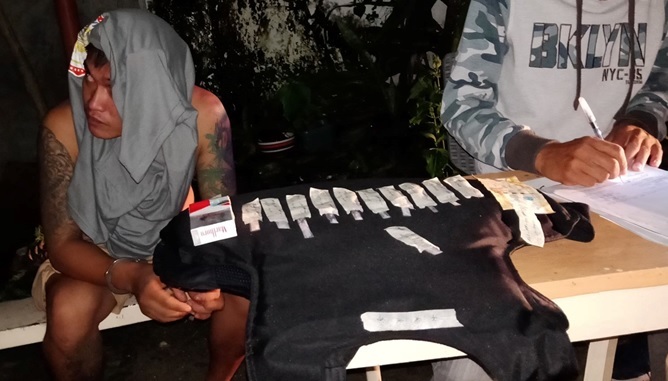 Police identified the apprehended alleged drug dealer as Mark “Jeboy” Culajara, 28, a resident of Kamantigue, Lindaville Subdivision in Tagbilaran City. In a report, police said that Culajara sold shabu worth P500 to an undercover cop during a drug buy-bust operation near his residence. The sting operation was set in motion after police allegedly spotted Culajara as he was selling shabu on Saturday night. Police said that they recovered from Culajara 10 packets of shabu which was estimated to be worth P15,000. Culajara admitted to being a drug user but denied that he was peddling illegal drugs.